Hi everyone! Hope you all enjoyed the long weekend. The girls and I had a lovely time in sunny Cambridge visiting my brother and sister-in-law. My sister-in-law is pregnant and has just had her first scan so we were able to tell the girls and show them the first photo of their new cousin! They were very excited as you can imagine!! Now on to my card!! This is for the challenge this week on the Daisy & Dandelion challenge blog. The challenge was to use circles on the card, as well as Daisy & Dandelion products. This gave me the perfect excuse to play with my lovely new nestabilites!!! The image and sentiment are both stickers, backed with white card, cut out and inked with pink fluid chalk. The papers are from the Daisy & Dandelion Picnic Patch collection. I've also had a play with various embossing folders!! I used swiss dots for all the circles. The pale pink circles are from cor'dinations card stock which I then sanded, the dark pink circles were wiped over with pink fluid chalk (Colorbox, Orchid Pastel). The large scalloped circle was embossed using the Perfectly Paisley folder. I then coloured over it with Dovecrafts Shimmer Chalks in a pale pink. I used a wet paint brush to try and make the colour a bit stronger. Finally, I embossed my dark pink flower (it was a plain one from a large pack at Lakeland and looked a bit boring!!). I used the Floral Fantasy embossing folder for this! Well, it's a long weekend for us as the girls have a couple of days off school/nursery for in-service days - so we're going to Cambridge for the weekend to visit my brother and sister-in-law. Two very excited girls here now trying to pack!!! Just before I go I thought I'd share these cards with you. I finally got round to making them as thank you notes for my birthday. I've been very disorganised lately and they're shamefully late!! I used the Sizzex Build a Butterfly die that came with my new Big Shot, and cut them out from assorted handmade paper. The sentiment stamp was from Clare Curd's Signature Range. Whatever you're up to this weekend have a good one - especially those in England who have Monday off as well!!! 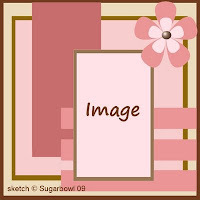 This is my entry for the sketch challenge on The Sugar Bowl. As well as the lovely sketch to follow, the challenge was to include buttons on the card. I've used the Gorjuss - Sent With Love stamp from Sugar Nellie, coloured with Staedtler colouring pencils. The blue card was embossed with the Cuttlebug Floral Fantasy embossing folder. Buttons and blue silk flower from stash. Green paper flower Papermania. Patterned paper - Clare Curd Big One paperpack. The plastic letters were free on the cover of a magazine ages ago - suddenly remembered them and they were the perfect colour!! The lovely Gayle is offering some blog candy to mark her Birthday. Visit her blog - Little Bird Design - by 31 May. See the picture on my sidebar!! Just a quick one to let you know about a new challenge blog launching on Monday 1st June. It's called The Next Level. They are also offering the most amazing blog candy - see the links on my sidebar!! Here is my entry for this week's sketch challenge on the Stampin' Chic blog. I have used one of my new Gorjuss stamps from Sugar Nellie, coloured with Whispers Brushmarkers. Black and green card from stash, cut with my lovely new nestabilities! Patterned paper from Clare Curd's CCSR Big One Paper Pack. Brads, adhesive gems and scalloped card blank all Papermania. Edges inked in ColorBox fluid chalk in Charcoal.